Pedi-cab drivers are required to meet with a representative of the pedi-cab company they want to drive for prior to applying for their chauffeur’s license. I originally planned on meeting with the owner of the company I want to drive for tomorrow, on Wednesday evening, since I had a conference call scheduled for tonight with some colleagues in Taiwan and we had some fairly important business issues to discuss. However, while I was on the phone with the owner trying to set up a time to meet, I asked him about scheduling availability on the upcoming Friday and Saturday nights. He said he still had a couple of slots open, but the Saturday slots probably wouldn’t last since it’s a game day and pedi-cab drivers typically make $300 to $400 on those days by working from 5PM to 2:30 AM (9.5 hours). I asked him what it would take to be guaranteed one of those slots, and he replied that I would need to train by Thursday, which would mean getting my license on Wednesday, which would mean meeting with him to sign off my paperwork tonight. Unfortunately, he could meet only at 7:45 at a location 25 minutes away from me. It was already 7:25, and my Taiwan call was at 8:00. I had to make a decision: work or pedi-cab? I analyzed it for 1.2 seconds, then told the owner I’d be right there. I emailed a note out to my workgroup telling them I had an emergency, then got on my motorcycle and raced to south Austin. I didn’t feel good about missing the call, but I figured I could call them when I got back–at 8 PM our time, they still have their entire day ahead of them. And plus, there was $400 at stake here. 2.5 game-day Saturdays of pedi-cabbing, and I’ll pay off $1k of the $90k obligation. It might not sound like a lot, but I know it will add up. I arrived five minutes early and got the sign-off. Tomorrow morning I’m getting my license and I’ll be ready to train on Thursday. I got back home at 8:20 PM and took the call. All good, crisis averted, $400 almost in the bank. My biggest priority going forward is that my second–and possibly third–job do not interfere with my career. Tonight, they definitely clashed, but I should be able to keep that to a minimum–I think I’m just experiencing some growing pains right now, and I should enter a zero-conflict steady-state schedule with this pedi-cab job starting this weekend after I get through all the bureaucracy . My new boss (it seems really odd to say that) seems like a genuinely good guy, and we got along well during the initial meeting. He’s laid back, talked about how close he is with his family, and it sounds like he runs a really tight ship. I think it’s going to be a good arrangement. He has a JD and used to be a stockbroker, so he definitely has some smarts. I think he’s in his early 30s. I should mention that I decided to go with a different company than the one I originally interviewed with last week. This new company has been a lot more responsive to my questions and they seem to be recruiting more actively in Austin, whereas the first company seemed fairly indifferent to my interest in working for them. Maybe it was just my slacks and polo shirt–I wore shorts and a t-shirt to today’s meeting. I’ll probably wait a couple of weeks before applying for a third job so that I can get a better idea of how lucrative (or not) this pedi-cab job is going to be and what kind of toll it’s going to take on my body. according to my new boss, pedi-cab drivers typically burn 8,000 calories per shift, and the boss man has seen his new hires lose about 20 pounds after only a few weeks of pedi-cabbing. I’ll be biking 9.5 hours on game days, 5.5 on non-game days, and going to bed at 3:30 AM on Friday and Saturday nights. I don’t know if I can sustain that and wake up at 7 AM to work an 8 AM job. I’m not afraid to work all weekend long and am willing to sacrifice all of my free-time for ten months, but I know that I do very poorly without 7+ hours of sleep every night. I’ll need to find a third job with somewhat flexible hours. As I indicated in an earlier post, I’ve been searching for a new job at work–a promotion–and I believe I might have found something. After the end of my fourth interview for the same job on Friday, the hiring manager told me he wants to move forward with an offer! I should be getting something formal from HR this week. No word on the salary bump yet, but my fingers are crossed. Everything helps, and in an earlier post, I assumed a 10% raise. I have my first roommate interview this Thursday. This is definitely my first rodeo, so I still have to get acquainted with best practices for renting out a room: where to find a good contract template online, what additional terms and conditions to add to it, the size of the deposit, whether or not I should make the last rent due at signing, etc. I talked to Sarah on the phone and she sounds completely cool. I’m hoping for the best. It required some paperwork, but the stocks have finally been liquidated at $14,100, and the IRA is pending liquidation at $12,267 less tax and penalty. Once the IRA is liquidated tomorrow or Thursday, I’ll pay off the $25k loan with these funds plus some savings. If you are a CPA and have a spare moment, please: Do I qualify for an exception to the 10% early withdrawal penalty since I’m liquidating my IRA to pay off student loans that were used to pay my tuition? Qualified higher education expenses paid with an individual’s earnings, a loan, a gift, an inheritance given to the student or the individual claiming the credit, or personal savings (including savings from a qualified state tuition program) are included in determining the amount of the IRA withdrawal which is not subject to the 10 percent early withdrawal tax. 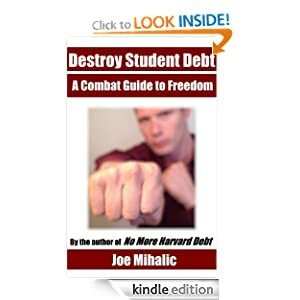 Qualified higher education expenses paid with a Pell Grant or other tax-free scholarship, a tax-free distribution from an Education IRA, or tax- free employer-provided educational assistance are excluded. Translation: looks like you can get around the 10% rule for at least the principal of the loan. Hope this helps! Thanks, Chloe! I’m going for it. Audit me all you want, suckers!! You cannot get out of the 10% penalty, you paid off a loan, not actually use the money to pay the college directly. Hey, thanks Sunny. Didn’t have time to stop by, so found a decent one online instead. Check with your city and state for rental regulations and sample leases. Michigan state provides a nice a doc with sample leases (http://www.mi.gov/documents/dleg/Tenants_and_Landlords_304581_7.pdf). Perhaps TX has something similar. Good call…found something online for now. Might upgrade if there’s turnover before I’ve paid off my loans.